Snow and freezing rain coats the westbound lanes of I-76 in Philadelphia on the morning of March 14, 2017. Well, the weather forecast just got more complicated – and potentially way more ugly. A pair of nor'easters on Tuesday and Wednesday morning will merge into an "intense blockbuster" storm off the Mid-Atlantic coast by Wednesday afternoon before heading off to the Northeast, according to the National Weather Service. 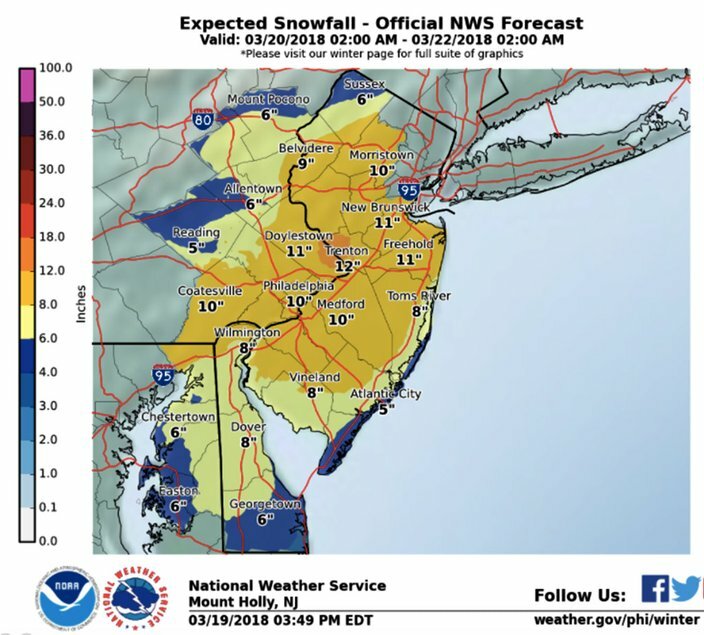 A winter weather advisory is now in effect for the entire region (except for the eastern half of South Jersey) from 8 a.m. to 6 p.m. Tuesday, with that advisory upgraded to a watch from Tuesday night through Wednesday night. 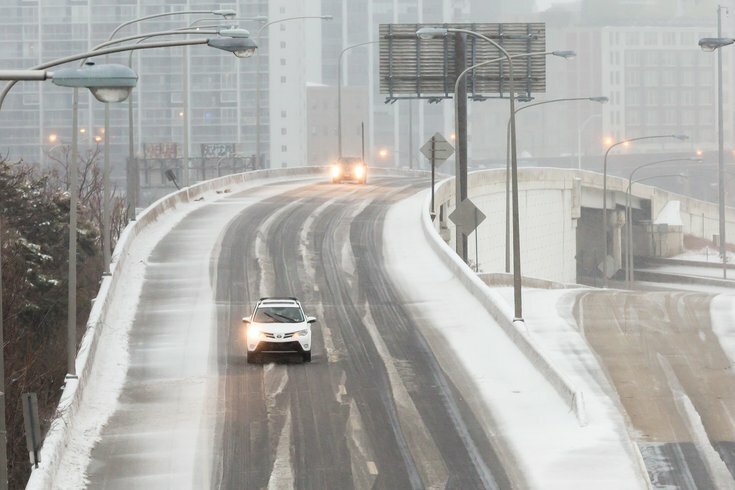 For the first phase of the storm, on Tuesday, forecasters said the latest models see a more northerly track – and more precipitation – from a low pressure system moving from the Midwest. A secondary coastal low will form off the coast and then absorb the weakened primary low. That means a very slow journey to the north and prolonged precipitation. One model, the NAM, offers a worst-case scenario, forecasters said, with a sleet storm for locations along and near the I-76 corridor. Other models support that picture, and still another sees a more snowy result. The bottom line: expect up to 2 inches' accumulation of snow, sleet, rain, and perhaps even freezing rain. Slippery road conditions should result in time for the Tuesday night rush hour. Rain is likely to the south of the city and strong winds are expected at the Jersey Shore. A wind advisory was declared for Cape May County and Atlantic County (along the coast). Forecasters underscored their forecast with uncertainty, noting it will not take much warming to be a mostly-rain event. Likewise, colder air with higher precipitation rates could mean big trouble for the Tuesday afternoon/evening commute, with more accumulation of snow and sleet possible. There is a lot of uncertainty about phase two as well, though it's looking snowy. Total snow accumulations on Wednesday look to be between 6-9 inches, with localized amounts up to 11 inches, forecasters said. Travel will be very difficult on Wednesday afternoon and during the evening commute when snowfall rates could reach 3 inches an hour. Gusty winds – 25-35 mph at times – will blow snow, hampering visibility. If we get that significant snowfall, the extensive tree damage and power outages we saw with two nor'easters earlier this month could re-occur, forecasters warn. And, yes, it's true, another storm system could impact the region next weekend. Monday night: Increasing clouds, with a low around 30. Northeast wind 5-8 mph. Tuesday: Snow before noon, then rain and snow. High near 36. Northeast wind 10 to 16 mph, with gusts as high as 28 mph. Chance of precipitation is 80 percent. New snow accumulation of less than one inch possible. Tuesday night: Rain and freezing rain, possibly mixed with snow before 3 a.m., then freezing rain, possibly mixed with snow and sleet between till 5 a.m., then freezing rain and sleet thereafter. Low around 32. Breezy, with a northeast wind 16 to 21 mph. Chance of precipitation is 100 percent. New ice accumulation of less than a 0.1 of an inch possible. New snow and sleet accumulation of less than one inch possible. Wednesday: Snow and sleet before noon, then rain and snow between noon and 1 p.m, then snow. High near 33. Breezy, with a north wind around 21 mph. Chance of precipitation is 100 percent. New snow and sleet accumulation of 4 to 8 inches possible. Wednesday night: Snow, mainly before midnight. Low around 30. Northwest wind 15 to 18 mph. Chance of precipitation is 80 percent. New snow accumulation of 1 to 3 inches possible. Thursday: Sunny, with a high near 44. Friday night: Mostly clear, with a low around 26. Saturday night: A chance of rain and snow. Mostly cloudy, with a low around 31. Chance of precipitation is 40 percent.